Ready for use in a 4" x 2.5" name badge holder, these Name Badge Inserts can be printed on laser and inkjet printers. Very Heavy Stock use Straight Pass Through, Cards are die cut from high brightness 110# card stock. This is a new product with Very Fine Micro Perforations giving the cards smoother edges! 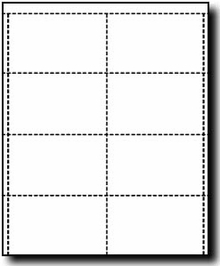 Each perforated sheet yields 8 Name badge inserts that are 4" x 2-1/2" in size.